Preview: Despite losing by 59 points to Ohio State in one of the more lopsided games of the year, Wisconsin still had a solid campaign going 11-3 overall with a bowl win coming against Auburn. After getting pressure from the Ohio State blowout loss head coach Gary Andersen decided to move laterally to take the head coaching job at Oregon State. 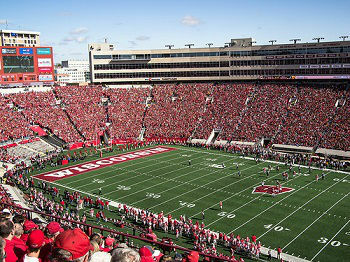 Wisconsin will bring in new head coach Paul Chryst who comes over from Pittsburgh. With a solid defense remaining along with a good run game in place the Badgers still look to be the team to beat in the Big Ten’s much weaker West division. Wisconsin’s offense heavily focused on the ground game last season behind the elite back Melvin Gordon. The Badgers return just 5 starters on the offensive side of the ball and this unit will be grooming a number of new faces to fill in the holes. Veteran QB Joel Stave will be back after regressing under Andersen’s watch in 2014. Stave didn’t provide the athleticism that Andersen was looking for, but he was clearly the best option to play under center. The O-line will be in somewhat of a rebuild with only 2 starters back, but the Badgers have some developing prospects ready to step up. The run game loses Melvin Gordon and his nearly 2,600 yards and 32 TDs will be impossible to replace. Veteran back Corey Clement will look to fill the massive void. The receiving corps remains underwhelming and this group will build around top returner Alex Erickson. The Badgers showed dominance on the defensive side of the ball against nearly all of their opponents in 2014 outside of Ohio State. The defense returns 8 starters and this unit should remain tough to score against in 2015. Despite the change at head coach, DC Dave Aranda was retained which was a win for Wisconsin who’s had difficulties retaining assistant coaches in the past. The D-line retains 2 starters in Aranda’s 3-4 scheme. The LB corps also brings back 2 starters to a unit that will be led by Biegel and Schobert. The secondary is a significant strength with 4 returning starters back to a unit that has great talent and experience to build around. Prediction: Wisconsin remains the team to beat in the Big Ten West given the amount of returning talent from last season’s division winning squad. The defense remains strong and this unit will be relied on more now that the offense is without Melvin Gordon. The offense will be rebuilding around a newly formed O-line. Look for the veteran QB Stave to bounce back in 2015 after showing solid signs towards the end of last season. There’s little chance the Badgers upset Alabama in week one, but this game will be a good measuring stick game for Wisconsin. Anything short of a return to the conference title game would be a disappointment.